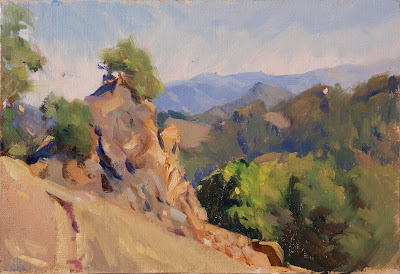 Literally the day after getting home from Mendocino, I started the Sonoma Plein Air event. The idea was to use Mendocino as a warm-up. 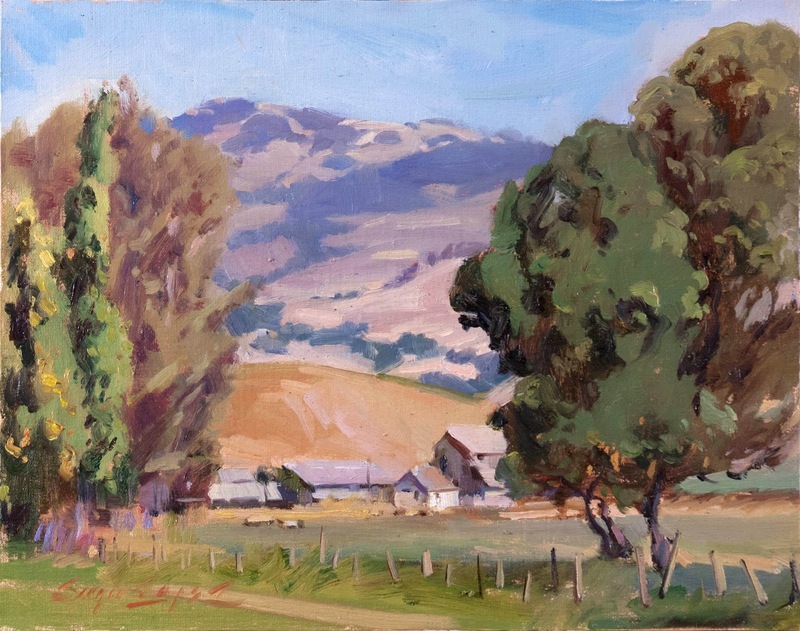 Canvases are stamped early in Sonoma. Once I checked in, it was time to decide where to go. 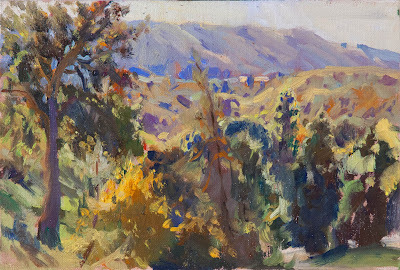 Indecision is the hidden enemy of the plein air event. If you can plan out where to go beforehand, you can save a lot of time driving around that you should be using for painting. 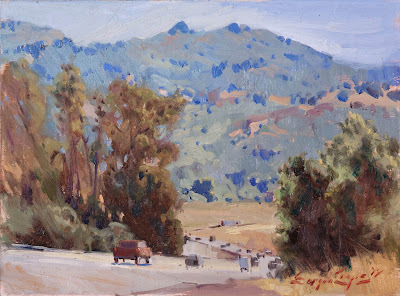 I ended up on Lakeville Road just outside of Petaluma to do this painting. 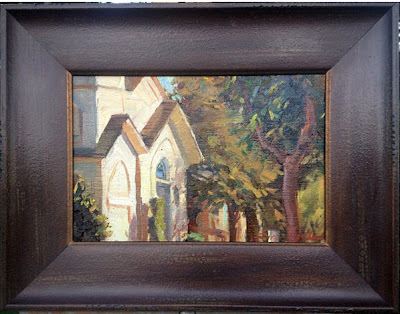 "The Old Commute" 9x12 in oil on linen. Got some lunch in downtown Petaluma(Mi Rancho, one of my fave cheap lunch spots) then drove down Highway 101 out to the edge of Sonoma County's south side. I found a large pullout to paint a scene I've been wanting to do for the longest time. I pass it every time I go to San Francisco, so most locals know where it was. 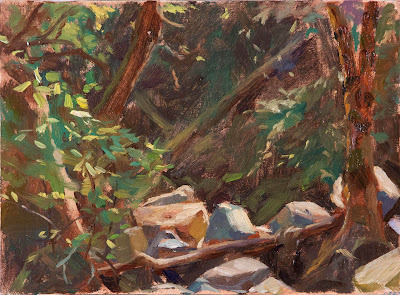 It was a warm day, and dehydration is another hidden enemy of the plein air event. I went back into to town to get a huge pink lemonade at In-N-Out with lots of ice... ahhh, much better. Ready to paint another. 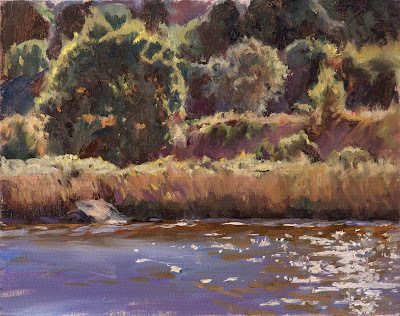 I ventured a half-mile over to Shollenberger Park where I painted this view across the river. The 101 is just beyond the oak. From here I went over to the Ramekins in Sonoma to meet and greet the rest of the artists, some of the hosts, and some of the best-tasting finger food I've had in a while. Crashed and burned on a painting I did in Spring Lake before getting lunch with other artists at the Quarryhill Botanical Gardens. It's a place I've wanted to visit for months now, so it was nice to get a free preview on behalf of the event organizers. Gorgeous gardens with much variety and some solid views if you go far enough up the hill. 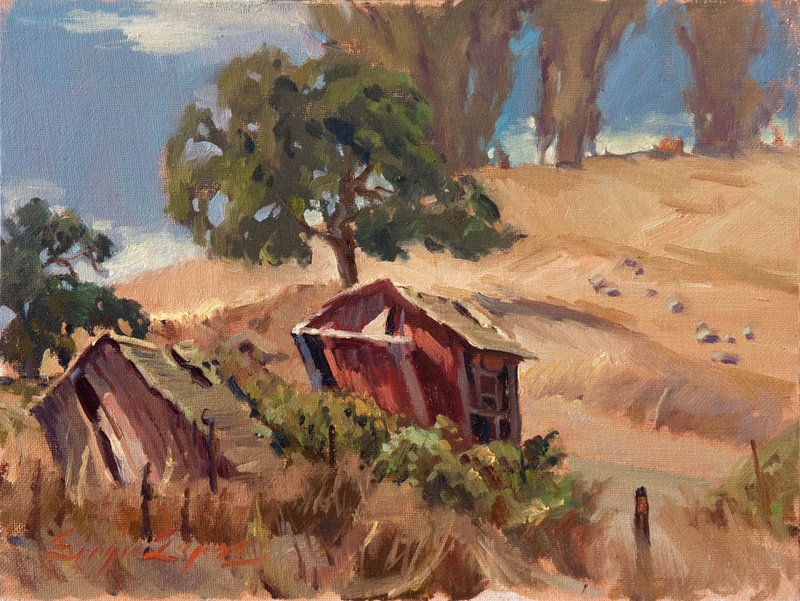 "Quarryhill Color" 6.5x9.5 oil on linen board. 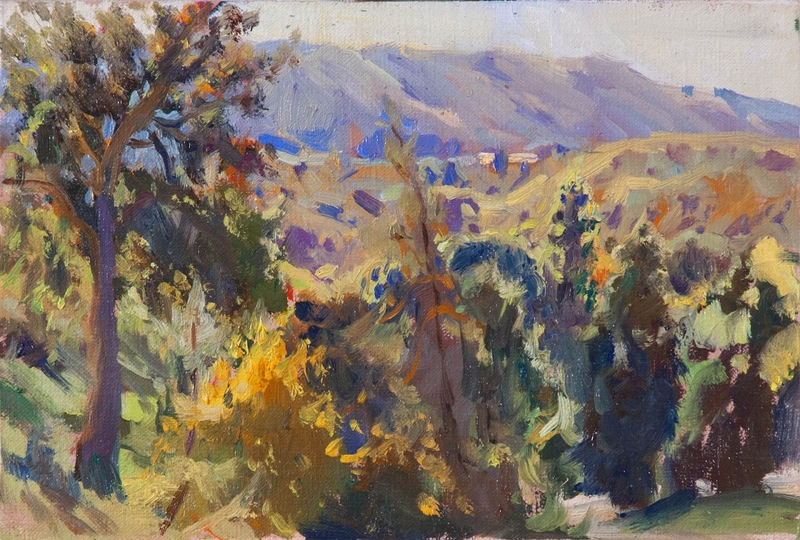 "Return To Autumn" 6.5x9.5 oil on linen board. Quick Draw: We started our paintings at 4:30 and had to have them framed and up for display by 6:00, so it was a quick draw indeed. 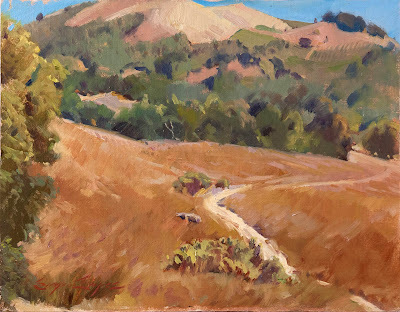 I think I handled the light decently well, but my cropping of the scene may have made it too obscure to be recognizably Sonoma. Might just have to do the clock tower next year. 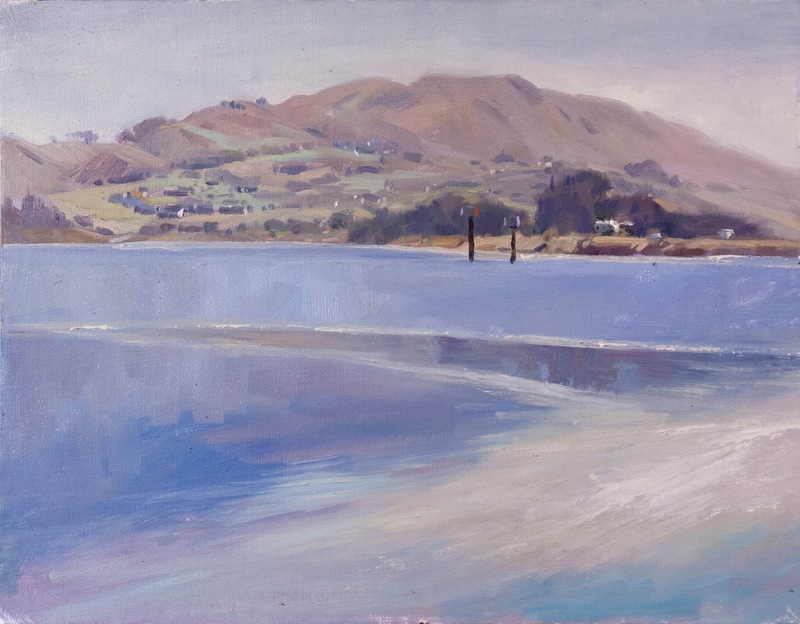 "Bodega Harbor Haze" 14x18 in oil on linen. I went to the coast on Wednesday which turned out to be a perfect day to do it. A perfectly clear day of sunshine with almost no wind. 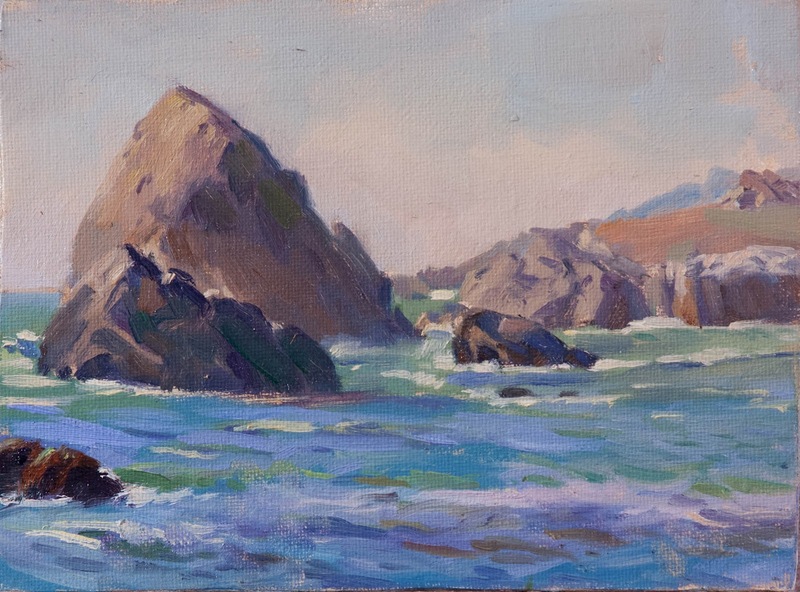 I stopped at the harbor on my way to Bodega Head and painted the misty morning before the fog completely dissipated. 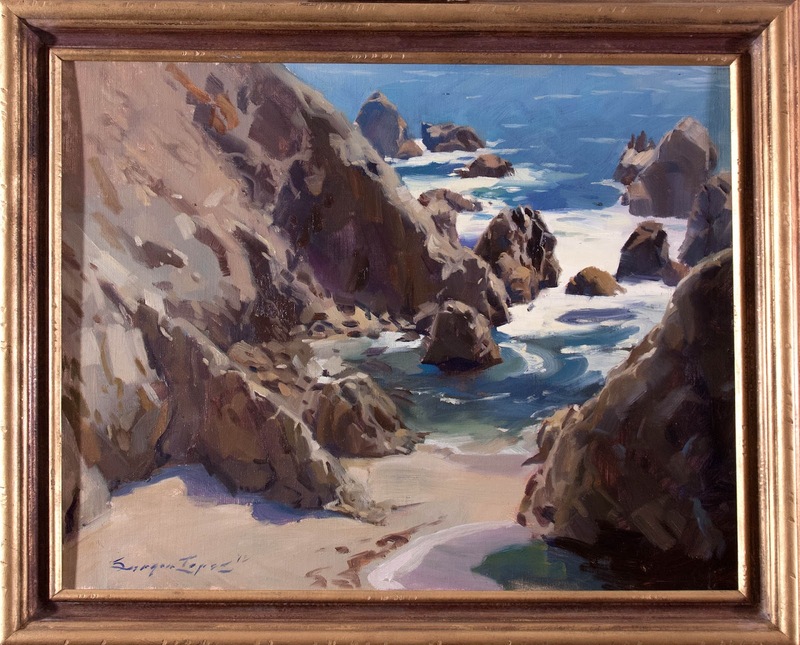 "A Rare Day In Bodega Bay" 16x20 in oil on linen. SOLD. The day was still warm, the wind still hadn't come in yet, so that meant it was time to paint the most ambitious piece of the week. This was a large complex piece where so many things could have gone wrong. 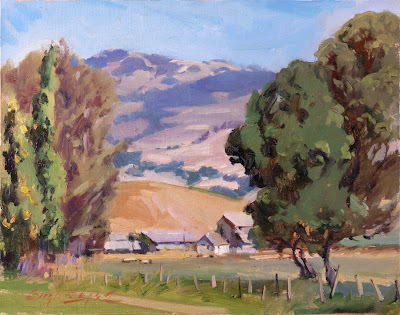 Fortunately I kept up the juggling act which is plein air painting for the required 2.5 hours it took to complete this painting. 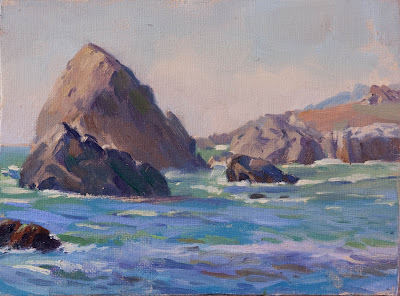 "Coastal Jade" 6x8 in oil on linen. I drove north up the 1 and stopped at Gleason Beach to paint this little scene. I had fun playing with the colors I saw. "Harvest Moon In The East" 8x10 in oil on linen. Came back into town to escape the wind that had started to kick up at the coast. I painted a scene near the Laguna De Santa Rosa, which is a favorite place of mine to paint. The moon was gorgeous as was the sky. This is the only painting I did over 2 days, because I came back the next day to work on it some more. 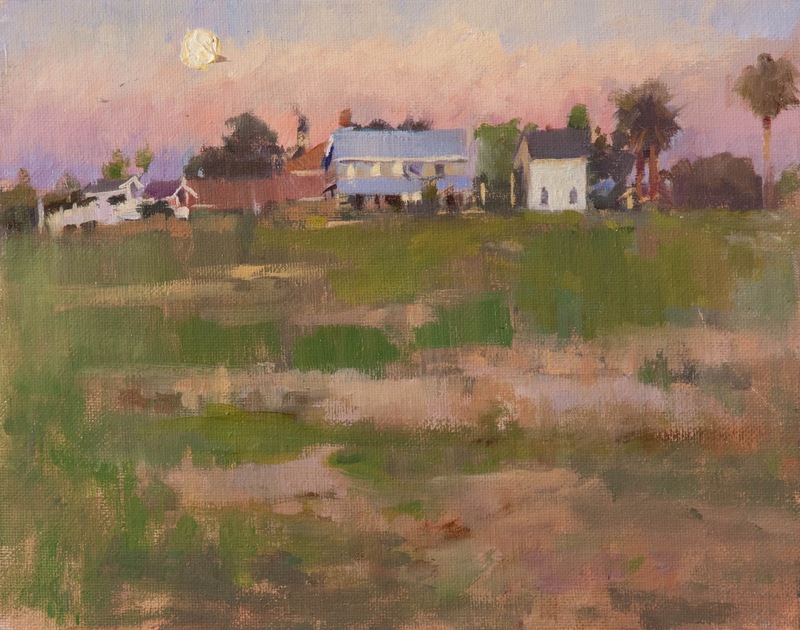 "A Need For Sure Footing" 6x8 in oil on linen. I had planned on spending the day in Sugarloaf so that's what I did. 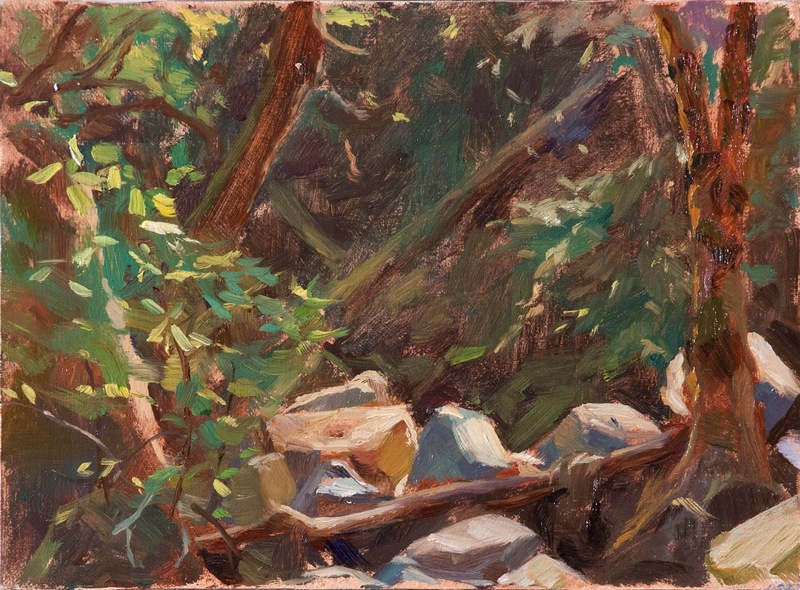 Started in the morning near the dried-up waterfall(bet it's raging now after yesterday's downpour...) I enjoy painting creeks but they are more fun when the water is flowing through them. "Anticipating Exploration" 11x14 in oil on linen. It took me a little while of hiking around the meadows near the parking lot to find a view that spoke to me. I can probably come back and repaint this scene to tweak the design into something stronger, but hey, decent study. "Lion Rock" 6.5x9.5 oil on linen board. The hike up to this scene was long and arduous, but worth it in my opinion. 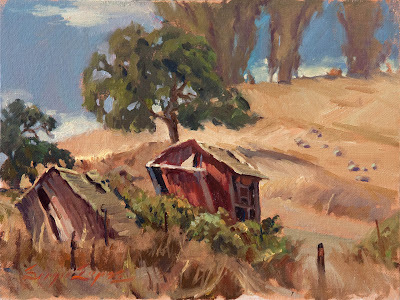 There is a plethora of views up there, but this was one I had wanted to paint for a while. I like this piece on its own, but I may do a larger piece of it sometime. "Barely Holding On" 9x12 in oil on linen. I already knew earlier that it was going to rain on the day of the sale, so I was prepared for the worst. Being prepared did not make me any happier of a camper. There were still a decent amount of people who checked the art out, despite the weather. Bless their hearts. I managed to squeak another sale in at the final hour, but for the most part it was slim pickings for a lot of artists. Being a Sonoma County native I am confident that I can sell plenty of these in my local gallery, so I am not that bummed out about it yet. Besides, the prize money and two sales made it the most financially successful plein air event of the year for me. Being the big winner can mean all sorts of great new opportunities for me in the future, so I am excited to see what this will lead to.